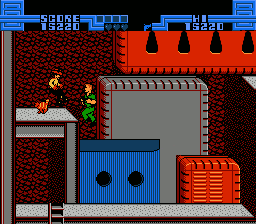 NES Total Recall (USA) in 04:46.11 by MESHUGGAH. This game is based on the movie of the same name, although some liberties are taken to give Arnold a chance to punch some hobos with boomerang tophats and go on an even more extended car chase than in the actual movie. There is also some terrible yet strangely hypnotic music. This run by MESHUGGAH improves the previous one by 15.39 seconds through overloading the object table to prevent some enemies and objects from spawning, better health management and various optimizations. For more information, see the author's comments.